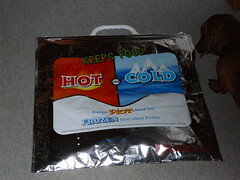 Have you seen these Hot/Cold bags before at the store? I had noticed them hanging off of freezer door handles for over a year before I broke down and bought one. I was shopping an hour south of home and located a flavor of sherbet my father had been desperately seeking for months; I knew I had to bring some home. I didn’t have high hopes for the bag but I hoped it would at least keep the product somewhat cool so that dad could have some cold soup by the time I reached home. To my amazement when I arrived home it was as rock solid as frozen delights are usually found at the store. Still I was not immediately converted. My mother had taught me that if I knew I was shopping a distance from home that I should always bring a cooler with me. While this may seem silly to some up in New Hampshire where I live the closest grocery store is a fifteen minute drive and it’s not even the “good” one. The problem with this is I hate having to get the cooler and clean it, never mind the clanging it makes as it sways drunkenly around the back of the car. So for a very long time I shopped at the sub-par establishment and cooked a simple routine of dishes. On a whim I broke from tradition and decided to give the Hot/Cold bag a shot. I made a week’s list of foods and off I went thirty minutes south to have a shot at fresh produce and people who actually know what cuts of beef I’m talking about. I have to admit that I shopped a little shyly planning on purchasing milk and other generic cold items closer to home, but I shopped unabashedly at the meat counter picking up pancetta, and some chicken. When I reached the produce section I was near tears at the beauty and quality of the vegetables. I greedily grabbled large bunches of greens, asparagus, herbs, and lettuces not having any plan as how to incorporate them into my menu for the week. I was like a woman marooned on an island only able to eat fish for years and finally able to sink her teeth into a prime cut of beef. At the checkout my checkbook was unhappy but I refused to let it upset the delirious high I was on. Out at my car I placed all of my cold items carefully into my special bag and made sure each of the snaps clicked. I placed the bag in a foot well to prevent unnecessary bouncing and ran episodes of the Food Network through my mind trying to think of what to do with my bounty. It’s been over two years since that escapade into the Hot/Cold bag territory and I’ve never looked back. I mention it to all of my friends and relatives as a great piece of equipment. Just stick it next to the front door and take it back to the car next time and you’re ready to shop at a moments notice – you don’t need ice – you don’t need heat packs, it simply works with the heat or cold from the items in the bag. For the ware and tare you get out of each bag I say its well worth the small investment and in the end when they need to be turned out to pasture they don’t owe you a cent. Best of all – they don’t clang in the back of my car. This entry was posted in cooking, delicious, Food, Food Network, Uncategorized. Bookmark the permalink. Thanks so much for this post! I have been kicking myself to buy one of those because I live a way off from shopping too. I often have things in the car for 1 1/2 hours – 2 hours. I am glad to know they work. I will get one next trip for sure. Not a problem. As I said I was retisent to purchase one too. Wow two hours! I thought my situation was bad. Thanks for letting me know I don’t have it all that bad. Why are all the walmarts are out of the hot and cold bags? Thanks for the review! We’re planning on going camping, about an hour away, and I’m paranoid about dairy products spoiling. I was wondering how these fared. I’ll have to pick up a few on my next shopping trip!